Using a combination of CIAO tools, we extract source and background spectra for an extended source. The background spectrum is grouped, if desired. The appropriate Response Matrix Files (RMFs) and Ancillary Response Files (ARFs) are created for both source and background. The specextract script automates these steps for extended and pointlike sources observed with the ACIS detector. To generate source and background spectra of an extended ACIS source and build the proper RMFs and ARFs. The Extract Spectrum and Response Files for a Pointlike Source thread handles the pointlike source case. Last Update: 17 Dec 2014 - Reviewed for CIAO 4.7; removed "New in CIAO4.6" sections. Minor edits. dsAPEPULSEHEIGHTERR -- WARNING: pulse height is less than split threshold when performing serial CTI adjustment. As only a small number of events are reported, the warning can be ignored. dmextract: to extract source and (optionally) background spectra. This tool also creates the WMAP used as input to mkacisrmf. sky2tdet: to create the WMAP input for mkwarf. mkwarf: to create weighted ARF(s). mkrmf or mkacisrmf: to build the RMF(s), depending on which is appropriate for the data and the calibration; see the Creating ACIS RMFs why topic for details. dmgroup: to group the source spectrum and/or background spectrum. dmhedit: to update the BACKFILE, RESPFILE and ANCRFILE keys in the source and background spectrum files. Weighted ARFs are generated by default, since weight=yes. For point-source analysis, or when you are not interested in the spatial variation of the effective area, unweighted ARFs can be calculated by setting weight=no. RMFs are - by default - generated without any weighting, since this can considerably speed up the running of the script and - for most cases - does not significantly change the result, since the RMF variation with position is small. If you do want to create weighted RMF files, then set weight_rmf=yes and weight=yes. Users can also specify a location at which to calculate unweighted responses - using the refcoord parameter - rather than using the location of the source and background regions. The regions are shown displayed on the event file in Figure 1. The background was chosen from a source-free area of the same chip for this example, but it may also be chosen from a different chip or different event file. Choose the background from another same-type chip that was on in the observation. If your source is on ACIS-S3 and ACIS-S1 (the other back-illuminated chip) was also turned on, define the background on ACIS-S1. 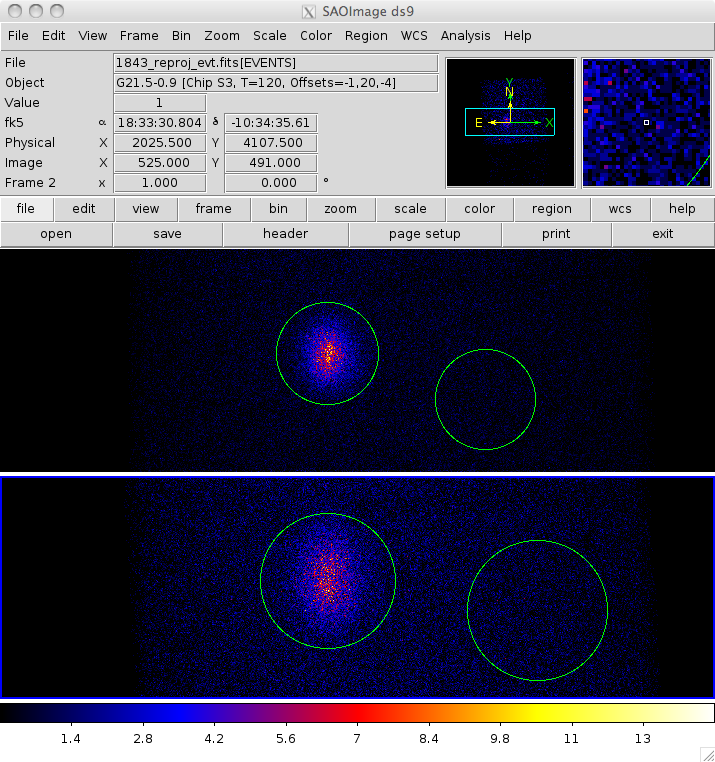 If using another chip from the observation is not an option, use one of the ACIS "blank-Sky" background files which are distributed in the CALDB. If you plan on using one of the ACIS "blank-sky" background files from the CALDB and intend to subtract the background spectrum (i.e. not fit it), then you do not need to create a background RMF and ARF. Set the bkgresp parameter to "no" and the script will only extract a background spectrum. Omit the background completely (i.e. leave the bkgfile blank). Updating header of simple.pi with RESPFILE and ANCRFILE keywords. Updating header of simple_grp.pi with RESPFILE and ANCRFILE keywords. Updating header of simple_bkg.pi with RESPFILE and ANCRFILE keywords. Updating header of simple.pi with BACKFILE keyword. Updating header of simple_grp.pi with BACKFILE keyword. The contents of the parameter file may be checked with plist specextract. If you want more details on what the script is doing, set verbose=2 before running specextract. The above call created an ARF and RMF for the background region; if you only intend to subtract the background, rather than fitting it, you do not need these responses so can save time (particularly if the background area is large) by setting bkgresp=no when running specextract. We choose to use the default grouping values: the source spectrum will be grouped to a minimum number of 15 counts per new channel and the background spectrum will be ungrouped. The grouptype and binspec parameters are used to specify the source spectrum grouping, and the bkg_grouptype and bkg_binspec parameters specify the background spectrum grouping. The energy_wmap parameter determines the energy band used to create the weight map when weight=yes. If you use the soft band (e.g. the default value of 300:2000 eV), then you are weighting by the emission from the source (unless you have a very hard spectrum). To weight by the effective area of the telescope (again, unless you have a hard source), set the range to, for example, 2000:7000 eV. Unless the spectrum of your source is unusual, adjusting the WMAP energy range will not affect the ARF - or,	therefore, the spectral fit - noticeably. This section explains how to manually run the analysis steps that are used by specextract. Make sure that you have set up ardlib to use the bad pixel file for your observation before following this section of the thread. First, we extract spectra from the events enclosed by the source and background regions. To create a WMAP block in a PHA file, dmextract must be given a binning specification for its wmap option. This WMAP will be used as input to mkacisrmf. It must be in detector coordinates, and the suggested binning factor is 8; an optional energy filter is included for the WMAP. unix% pset dmextract infile="acisf00869_repro_evt2.fits[sky=region(simple.reg)][bin pi]"
unix% pset dmextract wmap="[energy=300:2000][bin tdet=8]"
unix% pset dmextract infile="acisf00869_repro_evt2.fits[sky=region(simple_bkg.reg)][bin pi]"
You can check the parameter file that was used with plist dmextract. We now need to create the aspect histogram, which is a binned representation of aspect motion during the observation. The contents of the parameter file may be checked with plist asphist. 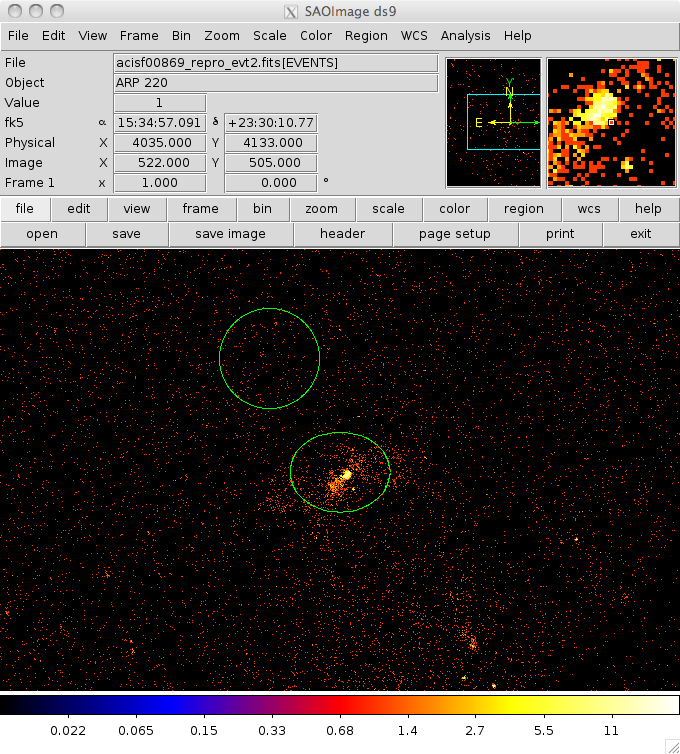 The WMAP created by sky2tdet properly weights the ARF based on how much of the source flux fell onto the bad pixels, columns, or a node boundary, and which bad pixels are actually exposed. Without accounting for these effects, the ARF is over-estimated. unix% pset sky2tdet infile="acisf00869_repro_evt2.fits[sky=region(simple.reg)][energy=300:2000][bin sky=1]"
If you made a separate aspect histogram for the background, set it in the asphistfile parameter before running the tool for the background spectrum. unix% pset sky2tdet infile="acisf00869_repro_evt2.fits[sky=region(simple_bkg.reg)][energy=300:2000][bin sky=1]"
You can check the parameter file that was used with plist sky2tdet. 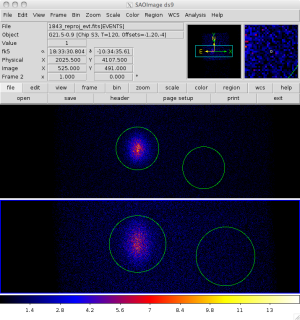 mkwarf creates a weighted ARF file based on the WMAP that was created with sky2tdet. It also produces a set of weights that are used by mkrmf to create the associated weighted RMF. You can check the parameter file that was used with plist mkwarf. The observation used in this thread (ObsID 869) was taken at the -120 C focal plane temperature. Therefore, mkacisrmf should be used to create the RMF file. The syntax for both mkacisrmf and mkrmf are given in this section. Users should choose the appropriate tool for the data and calibration. The mkacisrmf why topic has more details on using the mkacisrmf tool. The RMF doesn't change quickly enough to require the detail of the sky2tdet WMAP, and its precision will cause mkacisrmf to run very slowly. Nearly identical results are obtained with the dmextract WMAP with a more reasonable runtime. You can check the parameter file that was used with plist mkacisrmf. You can now skip to the Update the Spectrum Files section. The mkrmf tool uses the weightfile from mkwarf to create the weighted RMF. The tool queries the CALDB for the correct FEF file and the energy axis grid is ignored since the grid is read from the weights file. Note that although the axis1 parameter is ignored, a syntactically-correct value must be entered; this example uses axis1="energy=0:1". You can check the parameter file that was used with plist mkrmf. Sherpa has dynamic grouping capabilities so you can easily set or change the grouping of a dataset at the Sherpa prompt. For other data analysis packages it can be useful to create a grouped version of the spectrum as a seprate file. You can check the parameter file that was used with plist dmgroup. Finally, update the appropriate header keywords in the both the ungrouped and grouped source files. Note that the ungrouped background file name is used as the BACKFILE header keyword value. The source grouping is applied to the background grouping when fitting in Sherpa. For fitting only background data, or simultaneous fitting of source and background data, Sherpa can group background dynamically with the group functions; see the Fitting section of this thread for more information. In this example, we show how specextract can create multiple output spectra from a single run of the script. This example uses two observations of G21.5-09. Both observations will be processed by specextract at the same time, producing two sets of output files; this is explained further in the Run specextract section. and then use reproject_obs to reproject the data sets to a common tangent-plane position (i.e. so that the SKY coordinate system is the same in the two event files). New tangent point: RA=18h 32m 21.696s Dec=-10d 34' 41.484"
Reprojecting 2 event files to a common tangent point. As the screen output describes, the merged event file - in this case reproj/merged_eve.fits - should not be used for spectral analysis. The regions are shown displayed on the event files in Figure 2. ObsID 1842 is displayed in the top frame and ObsID 1843 is displayed in the bottom frame. Using an external file for a stack - such as multi_src.lis and multi_bg.lis - is useful when either the contents are going to be used multiple times or the contents are long, but you can also use a comma-separated list of values, which is what we do for the stack of output names (the outroot parameter). If you prefer, you may just give a single value for outroot and specextract will create output files designated as "src1", "src2", "bkg1", "bkg2", etc. The default values for combine, weight, and correctpsf (no, yes, and no respectively) are used. In the output below the bold lines show the ancillary files that were selected by the script. WARNING: A supported spatial region filter was not detected for @multi_src.lis, which is required input for point-source analysis with ARF correction. WARNING: A supported spatial region filter was not detected for @multi_bg.lis, which is required input for point-source analysis with ARF correction. Updating header of spec/1842.pi with RESPFILE and ANCRFILE keywords. Updating header of spec/1842_grp.pi with RESPFILE and ANCRFILE keywords. Updating header of spec/1843.pi with RESPFILE and ANCRFILE keywords. Updating header of spec/1843_grp.pi with RESPFILE and ANCRFILE keywords. Updating header of spec/1842_bkg.pi with RESPFILE and ANCRFILE keywords. Updating header of spec/1842.pi with BACKFILE keyword. Updating header of spec/1842_grp.pi with BACKFILE keyword. Updating header of spec/1843_bkg.pi with RESPFILE and ANCRFILE keywords. Updating header of spec/1843.pi with BACKFILE keyword. Updating header of spec/1843_grp.pi with BACKFILE keyword. These responses are weighted and there are responses for the background spectra, since weight=yes and bkgresp=yes. The red curve shows the data after background subtraction whereas the black curve includes the background contribution. If you would like to fit the background-subtracted source spectrum using a common RMF and ARF for source and background, simply read the source spectrum FITS file into Sherpa, subtract the background, and fit. See the Introduction to Fitting PHA Spectra thread for details. To fit source and background spectra simultaneously with distinct RMFs and ARFs, follow the Independent Background Responses thread. The RESPFILE and ANCRFILE header keywords in the source and background spectra have been updated, as well as the BACKFILE in the source spectra. This means that when the spectra are read into Sherpa, all the supporting files will automatically be read as well; the background (if available) will be defined, as will the source and background response files. 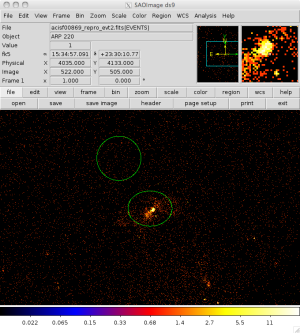 Users should be cautious about analyzing the data for sources near the edges of the ACIS CCDs. For X-rays passing through the mirrors, the very bottom of each CCD is obscured by the frame store. As a result, some of the events in rows with CHIPY <= 8 are not detected. (The set of rows affected varies from CCD to CCD.) Since the CIAO tools do not compensate for this effect, the ARFs and exposure maps for sources in these regions may be inaccurate. For sources within about thirty-two pixels of any edge of a CCD, the source may be dithered off the CCD during part of an observation. The aspect histogram, which is used to create ARFs and exposure maps, is designed to compensate for this effect. An ARF calculated at the edge of a chip will not be accurate since the response tools for spectral extraction (specifically the ARF) assume that 100% of the PSF is enclosed - i.e. on the chip - all the time, which may not be the case. The amount of error introduced depends on how close the source is to the edge, the morphology of the source, and the characteristics of the PSF, which depends on the source spectrum. A contaminant has accumulated on the optical-blocking filters of the ACIS detectors, as described in the ACIS QE Contamination why topic. Since there is a gradient in the temperature across the filters (the edges are colder), there is a gradient in the amount of material on the filters. (The contaminant is thicker at the edges.) Within about 100 pixels of the outer edges of the ACIS-I and ACIS-S arrays, the gradient is relatively steep. Therefore, the effective low-energy (' 1 keV) detection efficiency may vary within the dither pattern in this region. The ARF and instrument map tools are designed to read a calibration file which describes this spatial dependence. (bkgresp = yes)             Create background ARF and RMF? (weight = yes)             Should response files be weighted? (weight_rmf = no)              Should RMF also be weighted? (refcoord = )                RA and Dec of responses? (correctpsf = no)              Apply point source aperture correction to ARF? (combine = no)              Combine ungrouped output spectra and responses? (clobber = no)              Remove existing files? (clobber = no)              overwrite existing output file (yes|no)? (clobber = no)              Clobber existing output file? 12 Jan 2010 updated for CIAO 4.2: specextract uses a CALDB query to decide which RMF tool should be used; calibration update - the ACIS QE contamination model has been upgraded to vN0005. 09 Mar 2010 The ACIS detector is calibrated over the range 0.224004 - 12 keV; choosing values outside this range will result in errors from specextract. 04 Apr 2011 updated for 04 Apr scripts package release: acis_fef_lookup script prints the version at verbose > 0. specextract: user is prompted for the bkgfile parameter (previously was hidden); new parameter, bkgresp, determines whether a background ARF and RMF should be created; additional changes are outlined in detail in the script release notes for 04 Apr 2011. 12 Apr 2011 updated for 12 Apr scripts package release: specextract bug fix - regions may be specified on the command line or in a file, i.e. "sky=circle(344,435,10)" vs. "sky=region(src.reg)". 16 Feb 2012 a specextract bug fix was released in the 16 Feb 2012 scripts package: the script will not error out if you set outroot to be a stack and have correct=yes and weight=no. 08 Aug 2013 Updated for the contributed scripts 4.5.4 release: the "ancillary" files - e.g. aspect solution and bad-pixel files - can now be picked up from information in the event file (in many cases). 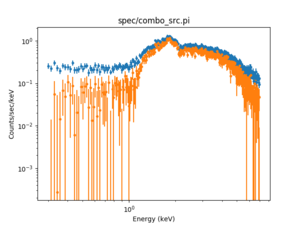 The Extracting Multiple Spectra section has also been updated. 12 Dec 2013 Review for CIAO 4.6: by default weighted RMF files are no-longer generated; the pbkfile parameter has been removed from specextract and is no-longer used by tools like mkwarf; the response files are now always named with the .rmf and .arf suffix, even when weighted; the multiple spectra section now uses reproject_obs to align the observations before source extraction; although not shown in this thread, specextract can now be used with HRC-I data sets. 17 Dec 2014 Reviewed for CIAO 4.7; removed "New in CIAO4.6" sections. Minor edits.